Robert Frost is one of my favorite poets. 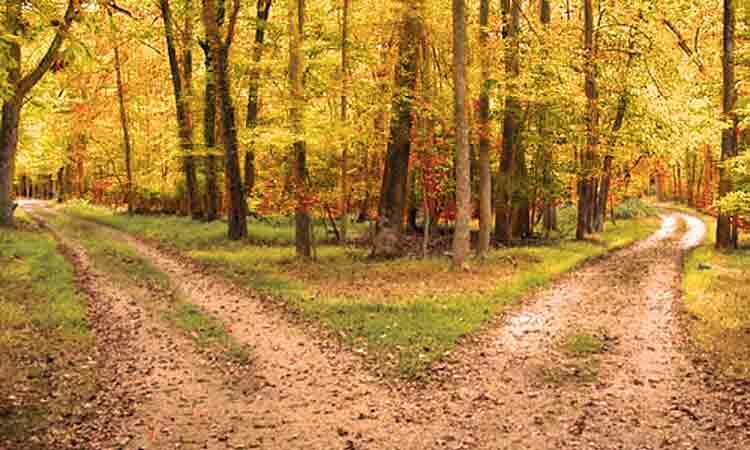 As he begins, “Two roads diverged in a yellow wood…”. It’s a line that reminds me where you and other IT leaders are with regard to building a workplace network. You are at a crossroads, and you have a choice to make. Your task is to build the kind of network that will enable your workforce to be as effective as possible. That means building a network for tomorrow’s smart digital workplace, which not only provides mobility, location services, and untethered unified communication, but also incorporates Internet of Things (IoT) smart building technology such as connected furniture and other intelligent building systems to deliver next-gen workplace experiences for end users. Your workforce is mobile. People travel globally, and they have multiple mobile devices – laptops, tablets, and smartphones. Even when they are back home, they move between buildings and between rooms and workspaces within a building. And thanks to consumerization, workers expect their workplace to give them a consumer-style experience of the highest caliber, with seamless functionality and all the bandwidth they need. Smart digital workplaces are changing the future of work. IoT-enabled smart buildings, combined with the cloud and mobility are creating new immersive experiences for workers. A smart digital workplace can enable a workforce to self-organize around specific tasks, rather than blindly following top-down dictates regarding who will work where, when, and with what equipment. Network architects and administrators must let go of the old paradigm that gave them central control and embrace the new paradigm in which the workflow is driven by end users. The new digital workplace should deliver reliable, high-performing, and personalized work experiences that foster creativity, collaboration, speed, and freedom. Security must adapt to mobility and new behaviors introduced by the smart digital workplace. The perimeter is wherever the mobile user is, not on the walls of a building. You have to apply security not at the edge of a fixed network, but to each user, wherever he or she happens to be. And security must be adapted to the plethora of new devices, including IoT sensors, which are enabling smart buildings. Let’s step back for a moment and think about what you’re trying to do. Regardless of the network, you have inherited, your job is to build a workplace network that puts your users first – that puts their needs at the center. If you started out with that as your goal, what kind of network would you build? Would it look like your legacy network, or would it look like something else? Generally, legacy networks were architected when networks were wired, not wireless. They often are proprietary, and although layers of management software have been added, control is unwieldy. The networks may have both wireless and wired segments, but often they are not integrated or centrally managed. Security is added in with third-party systems that are not part of the original architecture. That makes integration difficult and can lead to mismatched policies. Also, security isn’t geared to the current generation of mobile devices and tries to protect a workplace with borders. The complexity, proprietary design, and wired focus of these networks are not likely to take you where you want to go. Let’s say, however, you accept your responsibility to put users first, and you accept that users are mobile and carry with them several different devices. Your focus then would be on enabling a diversity of endpoints as you establish access policies and implement monitoring capabilities. Mobile users require connections to be established wherever they happen to be – and many of them might be in one meeting room at one time, causing bandwidth demand to spike. Your network should have sufficient bandwidth to allow for variable usage patterns. In a smart building, RFID tags combined with AI can track how spaces are utilized and identify where the most bandwidth will be needed. With mobility the norm, building walls are no longer the security perimeter. The network edge should be intelligent and should understand context and intent to dynamically orchestrate and secure connections for mobile users. To better comprehend user behavior and potential threats, you would apply AI technology to network security. A single architecture high-capacity wireless and wired network. Comprehensive policy management and segmentation of connected devices, users, and services that are not tied to traditional subnet/IP addresses and VLANs for policies. The end-to-end Aruba 360 Secure Fabric, including AI-powered detection of threats and attacks. Application-level services for location, asset detection, and more. Rich and flexible APIs for integration and management. AI-driven Analytics and Assurance, dashboards, and advanced UIs to manage the network. The smart digital workplace cannot be delivered by one vendor alone. With that in mind, Aruba is expanding its ArubaEdge Technology Partner Program with new ecosystem partners including Herman Miller, CBRE Group, Deloitte, Microsoft, Zoom and others. These new partnerships are validation from some of the most respected names across real estate and technology that a mobile first, consumer-in, open platform approach is the best IT infrastructure foundation for the future of work. With all these things in mind, we invite you to choose what might be for some the road less traveled – but which we believe will soon be the most widely deployed – the Aruba Mobile First Architecture. We think it will make all the difference.